Continuity mistake: In some shots (when the puppies run out the door & later out of the barn & also when just running in a pack), you can see that none of the puppies have black ears, yet many do. 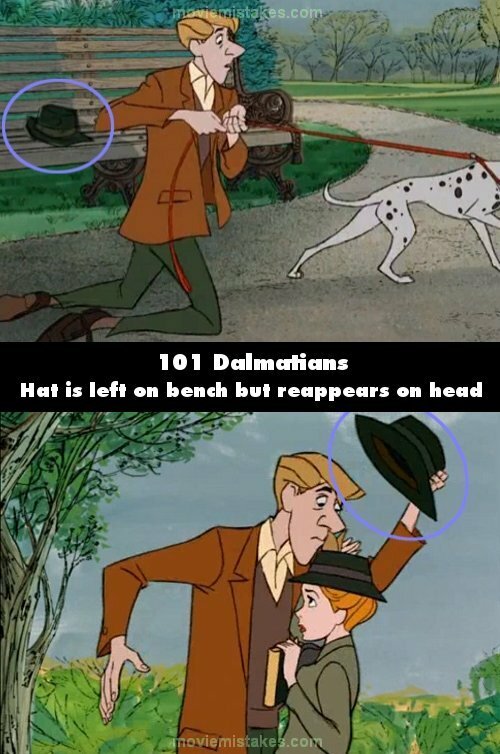 Continuity mistake: When Roger & Anita fall into the pond, Pongo's leash disappears from around their legs & even from Pongo's collar. Continuity mistake: When Perdy is giving birth, Roger gets up & starts to dance with Pongo. When he's standing, the pipe that was in his hand is gone. When he sits down, the pipe has returned. But, in the following shot, the pipe is gone again. Continuity mistake: The spot that gave Patch his name is sometimes over his right eye and sometimes over his left. Continuity mistake: Pongo & Perdy make their escape out through the hole in the door. Perdy is in front of Pongo. In the next shot, Pongo is in the front. Continuity mistake: The pups run up the steps. All but one (Rolly) reach the first landing. But, in the next shot, there are 3 other puppies still on the steps who jump up to the landing. Continuity mistake: Cruella pulls up next to the truck with the dogs in it. Next to the truck, you can see a hill going up. She then smashes her car into the truck & suddenly, the truck is on the edge of a cliff. A few shots later & you can see nothing but flat road behind them. Continuity mistake: Cruella throws the wine bottle into the fire. It explodes causing a big puff of smoke. The smoke clears & we see nothing in the air. In the next shot, shards of glass are flying through the air. Continuity mistake: The thugs fall down the steps & land on the middle landing. You can see all of the steps & there are no puppies on them. In the next shot, all of the puppies are on the steps, just reaching the bottom. Continuity mistake: Cruella goes flying off a cliff & lands her car into a snow bank. Her car goes half way into the bank, covering her windshield completely. But, in a shot from inside the car, you can see there is no snow on her windshield at all. Continuity mistake: Rolly stops on the steps & is all alone on the steps. He then starts to run up the second set of steps. In the next shot, you can see the entire set of steps, but Rolly is gone. Audio problem: When they pull away from the barn, the thugs' truck makes a screeching noise on the thick snow. Continuity mistake: In the old De Vil mansion, Jasper is drinking a bottle of wine. He pours it down his throat, then slugs it, then pours it again. When he puts the bottle down, it has hardly lost any wine in it. In the following shot of the wine bottle, the level has dropped even more. Continuity mistake: When the Jasper reaches for the bottle to throw at the cat, it still has wine in it. But when the bottle smashes against the wall, the bottle is empty and no wine spills out. Continuity mistake: The puppies are watching a western on T.V. One of the puppies (Patch) is biting a rug. After he says the line, "He'll get that yellow livered. ", the light brown ring on the outside of the rug changes to light blue. Continuity mistake: Pongo bites Jasper's shoe & rips it in half. But, a few shots later, it's mended. Seargent Tibs: Yes, sir. Righto, sir. Right away, sir. 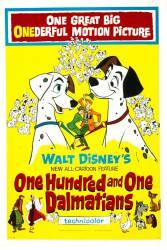 According Disney there were 6,469,952 spots painted on the dogs in the original 101 Dalmatians.